Tonight I was all set for our Mumbai Whisky Club’s monthly tasting … and as our host’s wife now regularly travels to Ireland, I had visions of sociable whiskies dancing in my head with a palate primed for pot still drams! Alas our sampling was unavoidably postponed to next week… but I just couldn’t shake that Irish mood… So decided it was high time to revisit the joys of Irish pot stills! A lot is said about the distinctive character of pot still whiskies – that they have a spicier character that comes from their way of blending malted and unmalted barley. Experts say it is this mash rather than the pot itself that qualifies a whisky as being a pot still whisk(e)y. Add water? With water becomes lighter with a delightful toasted nut finish – delightful. Our verdict? 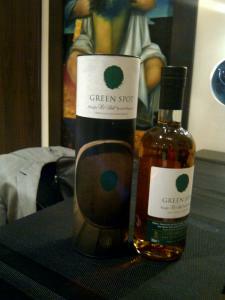 While Green Spot more than holds its own, it brought back memories of the superb Yellow Spot. Value for money and an excellent example of what a single pot still can produced. From Ireland, a single pot still Irish whisky produced for Mitchell & Son of Dublin, matured in bourbon, sherry and Malaga casks. Our verdict? – Complex, with a gorgeous flavour that lingered… It has garnered some very well deserved praise from Jim Murray (and us)! An exceptional whisky that hit all our favourite counts for a wonderful malt. Finish – Stays keeping you cosy warm, like Christmas time, curled up by the fireside sipping spiced mulled whiskey, creamy, fruity, toasty warm yumminess! Our verdict? 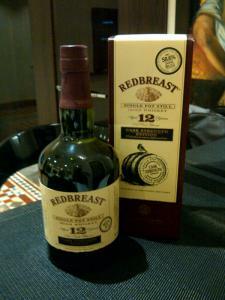 Ooooohhhhh the Redbreast definitely caught our attention and appreciation! This is certainly one worth revisiting. 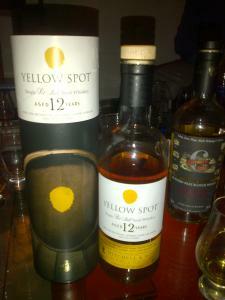 First sampled November 2013… I later tried the standard 40% and must say, this cask strength one is by far my preference! This entry was posted in Beyond Scotland, Ireland and tagged Green Spot, Irish, pot still, Redbreast, Yellow Spot by Carissa Hickling. Bookmark the permalink.